I have a special love for Cadbury mini-eggs. They remind me of my Mom, who always let me buy the little single serving packs they had near the register at our neighborhood grocery store growing up. To this day I can’t stay away from them and in our house we affectionately refer to them as Crack-bury eggs. They’re evil little things really. Have you guys tried the dark ones? Man, those are even better. Recently I had the brilliant idea (if I don’t say so myself) to smash them up and throw them in soft and chewy chocolate cookies. It was a good idea. The flavor of the eggs comes through and you get those signature crunchy shells in there, too. I find the quickest and easiest way to chop the candies is definitely putting them in a plastic bag and just smashing them. I like to leave some big chunks in there as well as the little slivers. Pro tip: Save a few of those eggs and after you drop your dough onto the sheet, place them on top with the colored coating facing up. That way when they bake up they have those pretty bursts of pastel color and everyone will know exactly what’s in there. These are slightly crisp on the outside and soft and chewy in the centers. I like to underbake them so they’re like a gooey brownie in the middle. Now that Easter is almost over and Cadbury eggs are on clearance, you really have no excuse to make these! Or you could also raid your kids’ candy baskets and toss in chopped up chocolate bunnies, mini candy bars, or whatever. Can’t really go wrong with this one peeps. Haha, peeps. Preheat oven to 350. You’ll need to chop up those Cadbury Eggs. I just put them in a ziplock bag and bang on them with a marble rolling pin until they look like the picture below. A hammer would work too. Go get a kid and put him to work. You know the drill. Cream together the butter, crisco, brown sugar and white sugar. Add in eggs one at at a time and the vanilla. 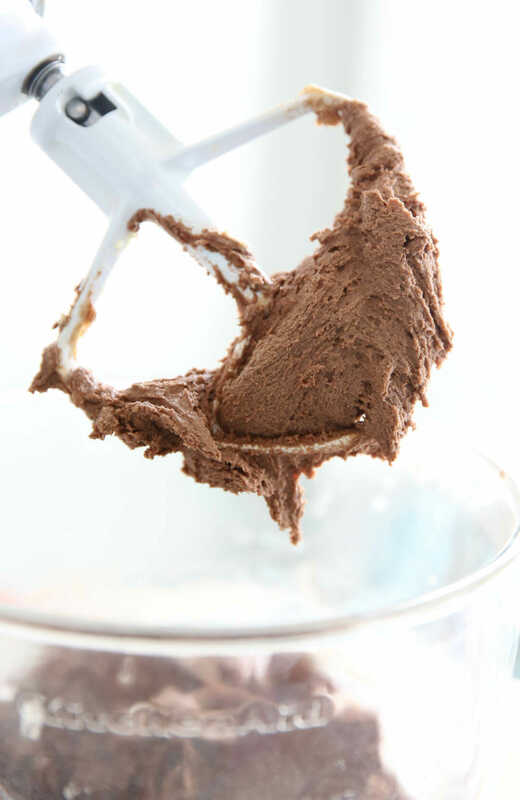 In a separate bowl whisk together the flour, soda, baking powder, salt, and cocoa powder. Add to the butter mixture to combine and then mix in the candies. 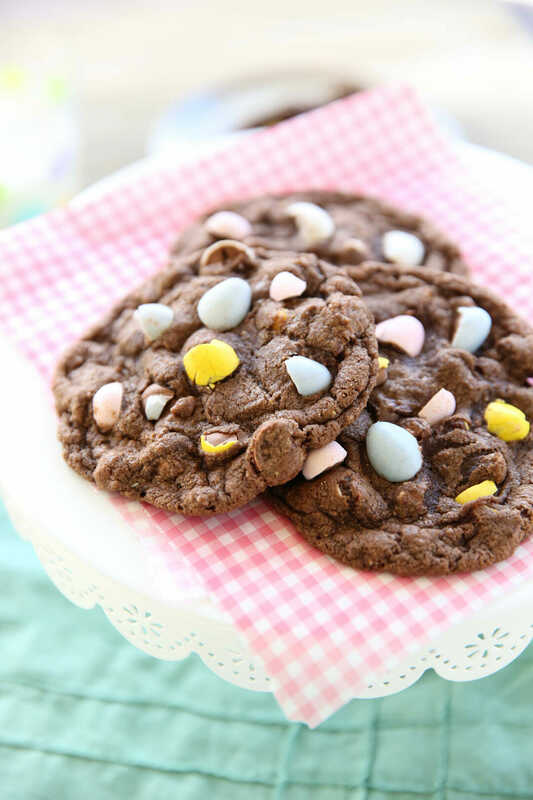 And a little secret…if you want your cookies to look pretty like mine, save a few egg pieces and pop them on top of the cookies before baking so you get those colorful speckles on top! Drop onto a cookie sheet and cook for about 8-10 minutes. Mine are always done in exactly 9. They’re soft and fudgy in the middle and a little crisp on the edges with crunchy little candy bits throughout. Yummers. Love these cookies! The cadbury chocolate eggs are my favorite and I usually only buy the tiny one person bag because I can’t stop eating them! Have a fun trip, Sara! I almost bought a bag of those babies the other day, but knew it would be the end of me… Maybe I’ll have to get some just to make these cookies. 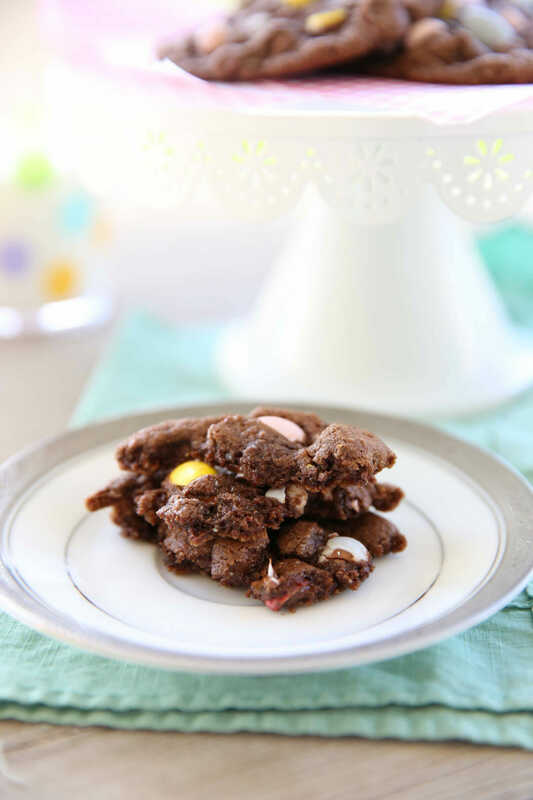 Oh my word…I love Cadbury eggs and this recipe sounds delish!! Can’t wait to run to the store and grab a bag to make these for the weekend. Have a great trip! First off, I love candy in cookies..this is perfect! 🙂 And second…”they knew we were on to them” love it! I just finished off a whole bag of those Cadbury eggs all by myself! Now I need go get another one so I can make these cookies!!! Easily one of my favourite things you’ve ever created. The chocolate like, melts into the cookies and makes them AWESOME. Love!! Thanks Sara! Oh you blessed blessed girl. I’m making these tonight and watching a chick flick cuz my hubby is out of town. Thanks Sara you rock!! Have a wonderful vacation! This would be a great way to use up some leftover Easter treats. Oh these look DELISH! I’m gonna have my hubby pick some up from the store. Do you think regular flavored crisco would be ok? Okay, I’m seriously obsessed with those eggs. Gain weight every year between Feb and April (good thing I’m pregnant this year so I have an excuse.) I’ve always wanted to make a cookie with them. Thanks! 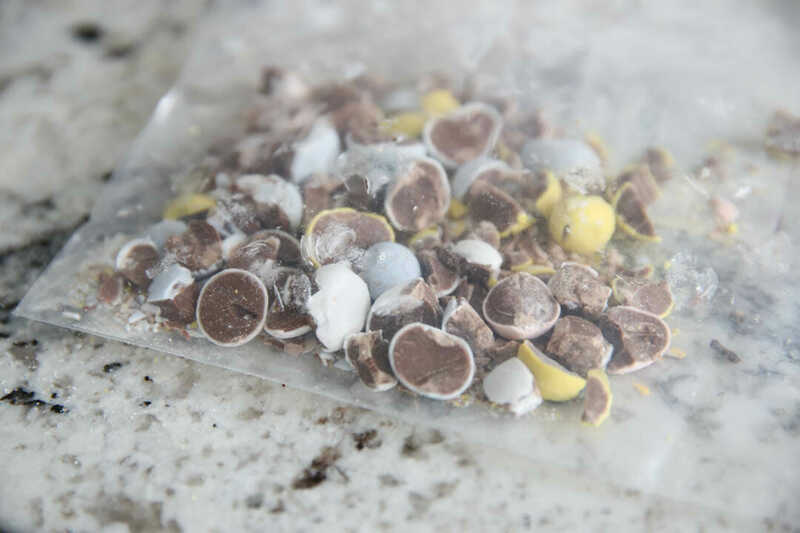 I’m super excited because my hubby just bought me a huge bag of those Cadbury mini-eggs and can’t wait to try this recipe! Happy Easter ladies! In the ingredients it lists both baking powder AND soda, but then only mentions the soda in the narrative. Does it really call for both?? this looks great! We are cadbury addicts here! glad to know I did not just get BIGGER this year.. it is the egg! I made them tonight without the baking powder, they turned out wonderful! Seriously great combo, cookies and cadbury mini eggs, heaven! We used all our real eggs up silk-dying last night. Can you substitute with Cadbury Creme eggs? Argh, I had a genius idea, but it was right after Emily got back from the store with the ingredients to make these. You mentioned that you could make these cookies with peanut butter chips. Have you had the reeces pieces mini eggs? They are just like the mini cadbury eggs, but filled with peanut butter goodness (well at least peanut butter flavored goodness). You could make the recipe with those or mix in both of them, ummmm. Maybe Monday. ooh, no I haven’t tried the reeces eggs, but they sound like they’d be amazing. I’m thinking you’ll just have to make a second batch on Monday. And can you overnight some to Hawaii for me?? Yummy! Thank you for the recipe. The mini Cadbury eggs are so good. I can only buy a small amount or they will all disappear in my mouth too quickly. That video was great. Enjoy your tropical vacation. My turn is coming in a short ten days! Jennie-I do remember Ken. Isn’t he a coach? I was in high school a couple of years ahead of his daughter. Small world! By the way, your cadbury egg recipe looks GREAT! OK, I just accidentally left a comment on your blog instead of another one–I feel so dumb. It was meant for someone else I know! Just ignore it-I’m so sorry 🙂 And your recipe does look delicious. I’ll have to come back by! This is the first time I have visited your website. I’ve only been on for 5 minutes and I am impressed and so excited for new recipes. THANK YOU!! That is hilarious that he brought the eggs to the show. Two funny men right there. Good stuff. YUM… Did I say YUM?? Love Cadbury eggs and would venture a guess they’re the best thing about Easter candy! Gotta see if I can find some to make these. I might die. Cadbury mini eggs are my all-time favorite candy. ever. these are heavenly. now if only i could find some on easter candy clearance – i would be in heaven. I made these cookies last night and they are soooo good. Thanks for the recipe!!! I didn’t have enough Cadburry Eggs after Easter for this but I had tons of Rece’s Pieces so I used those instead. It was SO good. This is my new favorite cookie recipe. Thanks! Though I’m not huge on chocolate(at least not staggering amounts of it), so if I omitted the baking cocoa and redistributed the leavening amounts as 1 and 1/2 teaspoons baking powder and a 1/2 teaspoon baking soda, would the recipe come out okay? I want to make these for my last day of freshman year. I made these yesterday with some children at school and they had so much fun! The best part of course was eating them. They made some with white chocolate chunks and some with peanut butter M&M's. They were awesome! Every recipe I have tried from your blog has turned out fabulous. You are my go to gals when I am looking for something yummy! oh this is amazing! those candies are my favorite easter candy! There is a Christmas version of mini eggs now. I found it a few years ago, so now I've got to try this recipe for Christmas treats. I'm trying to think here, but I haven't made these since last Easter! I'm going to guess though that it makes about 3 dozen. I'll make sure to add that in for sure next time I make them and can count! Angie, I just find that in this recipe the shortening/butter combo results in a soft cookie that holds it's shape. You could use all butter, but sometimes they flatten out a little too much. oh my goodness, these are soo delicious! thanks for sharing! Of course, mine weren't as dark and my candies were hiding little lumps in the cookies. I can never make stuff as beautiful as you, but they sure were tasty! Wow, I call them Crack Eggs. AMAZING! Okay – I made these for our Christmas cookie tins this year but I used Hershey's Mint Chocolate Chips instead of Cadbury Eggs. OH MY GOD! It's heaven – in a cookie. I just bought 2 big bags of Cadbury mini eggs to make these cookies with. Problem is? I HAVE to start my diet back up. I made these today. I love Cadbury chocolate eggs. My husband said they were the best cookies I have ever made and he doesnt like chocolate cookies. I am making these right now with my daughter. Blaming your web site to turning me on to ‘crack eggs.’ Thank you, they are awesome! Love this recipe. So easy & quick, just made with my 4yr old daughter. We used PB chips this time and I’m looking forward to making them again with mini eggs as my husband is obsessed with mini eggs. Just made these–YUM-O!!! Big hit, luckily my husband took most of them to work! 🙂 You guys ROCK! I’m looking for a kid-friendly, mess free treat for after Easter dinner this year. These sound fantastic. I’m looking forward to “trying them out” beforehand too. How many cookies will the batch make? I just pulled these out of the oven on OH MY are they amazing! I so thought that I was the only one who was addicted to these things. I’m always tempted to buy a couple of cases so I can have them year round. Can’t wait to try the cookies, only now the mini eggs are gone from the stores. I just made these with my son and his friend, and all I have to say is, WOW!!! They are amazing! Thanks for sharing another great recipe…I remembered it from when you posted it last year and bought a bunch of the eggs to make sure we could make them this year! Wow! I’m new to your blog and this is the first recipe I’ve tried. I cannot stop eating these cookies…they are amazing! Thanks for sharing such a tasty (and perfect for Easter parties) treat. canNOT wait to try these. i haven’t seen an amount listed – how many cookies are people getting from this recipe? These look SO good! I really wish I would have found this recipe before easter. I guess I’ll just have to try it out next year. These cookies are really good! You are a good cook. These cookies are really good! We had fun making them! Forgive me if this is a silly question but I am in Canada and all of our minit egg packages are in grams. If I did my conversion correctly the 10oz would be around 7 of the individual serving bags – does that seem right? Doesn’t sound too far off- really you can just eyeball it. Can’t really mess it up! salted or unsalted butter? makes 3 dozen? OK, was going to make the Candy Cane Kiss cookies but then couldn’t find the kisses, so thought about making the cookies with the Christmas Cadbury mini eggs I bought by crunching them up…then decided to google mini egg recipes to see what options were out there and I got this….proof yet again that my life really does revolve around the amazing recipes from you ladies!!! Bake on!!! HOW excited could I possibly get when I saw that they are selling CHRISTMAS Cadbury mini eggs!!!! Oh ya baby! Can’t wait to bust this recipe out again this year! Wahhhhoooooo! 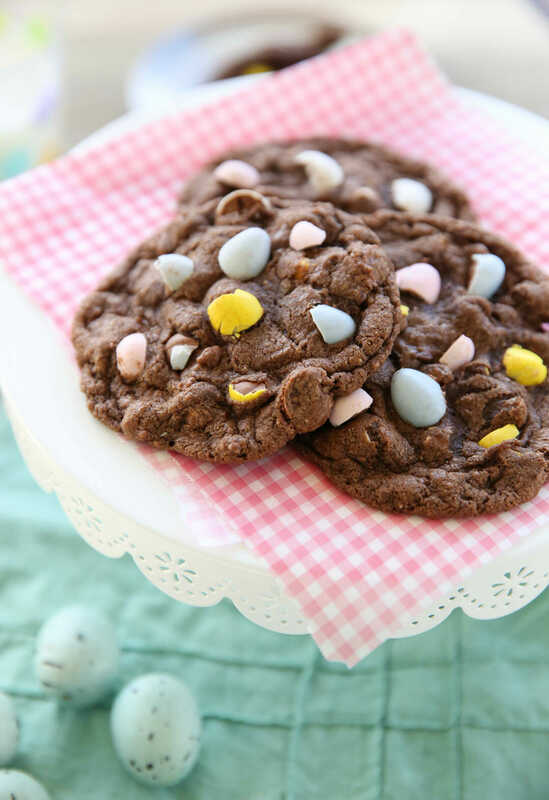 Made these today….I was lucky and scored cadbury mini eggs on amazon for a steal. Now I can make these several times this year! They were fabulous! I know this is an older post, but if anyone is still wondering I made these today and it ended up making one cookie shy of 4 dozen. I used about a tablespoon of dough for each, or just a little less, and they turned out perfectly. This is good information to have before you make them so that you don’t have to wonder what to do with the extra dozen cookies, because I guarantee before you figure out who to give them to you will have eaten them all. They are amazing. Just made these tonight for Easter tomorrow! They came out perfect! Thanks for the recipe!! Thanks for sharing! They look fantastic! I shared them on my site, bostongirlbakes.com, can’t wait to make them! I made these cookies a few years ago and people still talk about them. I was in the grocery store a few days ago and just before i went to the check out, I noticed some reduced Easter items including Cadbury’s white chocolate mini eggs – I swooped up a bag and as soon as I got home, I knew exactly what I was going to make with them 🙂 Thank you Sara, this really is a brilliant recipe! 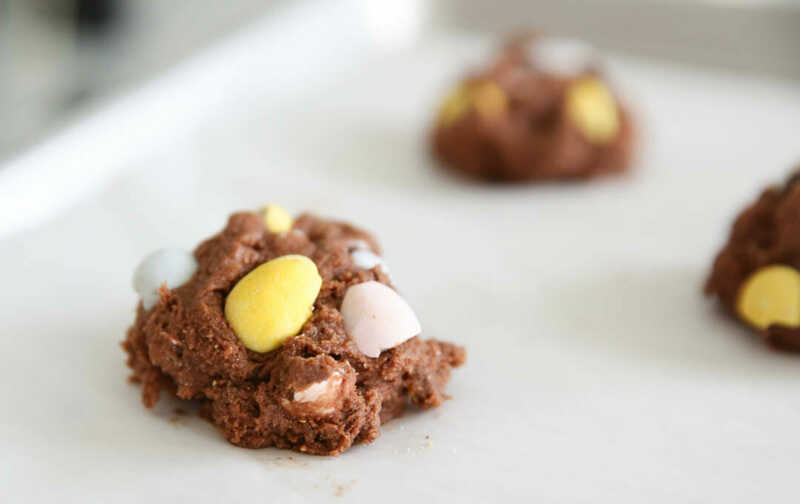 I recently tried some “holiday mint” m&m’s and my mind when straight to the mini egg cookie recipe! I’ll post an update in a few days after I make them. ? Have you ever tried microwaving the mini eggs? I’ll put 6-8 (or 16) on a paper towel in the microwave for 20-30 seconds theyre Delicious !!!! Why the combo of butter and butter flavored Crisco? Would it work with all butter instead. I hate to buy Crisco because it would never get used for anything else and would be a waste. This recipe was developed for both texture and flavor using both. You can certainly use all butter- they will probably be a bit flatter but still taste amazing! 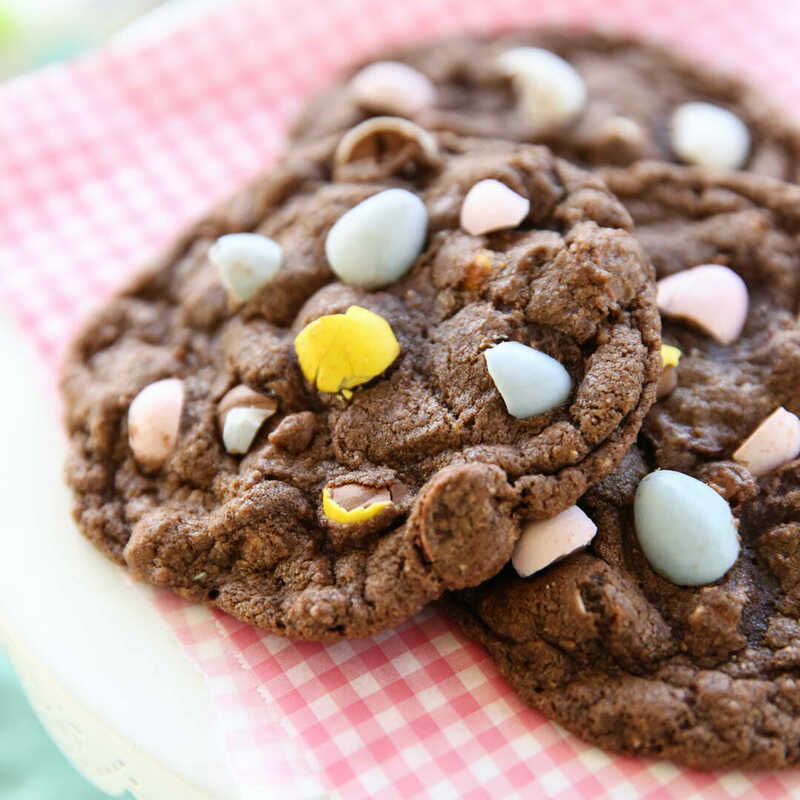 I keep trying to make these but I eat the bag of Cadbury eggs before I get time to make the cookies! Has happened twice now. Next Post ❯ Next post: Introducing: The Fit & Fast Meal Plan!